Anthony Robbins is an authority on the psychology of leadership, negotiations, organizational turnaround, and peak performance. He has impacted the lives of nearly 50 million people from 80 countries with his public speaking engagements and live appearances, along with his audiotape products and best-selling books like Unlimited Power. He is called upon by leaders from all walks of life, including presidents, CEOs, athletes, and entertainers. Robbins is a successful entrepreneur and chairman of six companies. He has been honored by Accenture as one of the “Top 50 Business Intellectuals in the World” and by American Express as one of the top six business leaders in the world to coach their entrepreneurial clients. A much sought-after speaker, he has addressed such distinguished audiences as the British Parliament and Harvard Business School. Book Review: Awaken the Giant Within - How to Take Immediate Control of Your Mental, Emotional, Physical and Financial Destiny! Anthony Robbins has met with, consulted, or advised a number of international leaders and currently serves as Vice Chairman of Health, Education, and Science for the United Nations/Research Center for the International Council for Caring Communities (ICCC) NGO. He has developed and produced four award-winning television infomercials, and his work has been featured in major media worldwide. He had an acting role in the hit movie, Shallow Hal. • The truth of the matter is that there’s nothing you can’t accomplish if: (1) you clearly decide what it is that you’re absolutely committed to achieving, (2) you’re willing to take massive action, (3) you notice what’s working or not, and (4) you continue to change your approach until you achieve what you want, using whatever life gives you along the way. • Action is the foundational key to all success. • If you develop the absolute sense of certainty that powerful beliefs provide, then you can get yourself to accomplish virtually anything, including those things that other people are certain are impossible. • If you want to be successful, find someone who has achieved the results you want and copy what they do and you’ll achieve the same results. • We are the only beings on the planet who lead such rich internal lives that it’s not the events that matter most to us, but rather, it’s how we interpret those events that will determine how we think about ourselves and how we will act in the future. • Any time you sincerely want to make a change, the first thing you must do is to raise your standards. When people ask me what really changed my life eight years ago, I tell them that absolutely the most important thing was changing what I demanded of myself. I wrote down all the things I would no longer accept in my life, all the things I would no longer tolerate, and all the things that I aspired to becoming. • Once you have mastered time, you will understand how true it is that most people overestimate what they can accomplish in a year—and underestimate what they can achieve in a decade! • I discovered a long time ago that if I helped people get what they wanted, I would always get what I wanted and I would never have to worry. If one thinks of Dale Carnegie as the grandfather of the 20th century Self Improvement movement, then Anthony Robbins is his successor. 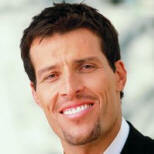 Robbins has a tremendous ability to excite people and motivate them to action. And Self Improvement is, in many ways, about taking action. Robbins’s main focus is helping us achieve peak performance. He shows us effective strategies and techniques for mastering our emotions, our body, our relationships, our finances, and our life, and he provides step-by-step programs, teaching the fundamental lessons of self-mastery. To gain an understanding of Anthony Robbins, you need to listen to him speak, either on tape or by going to one of his live events. He has written several very successful books, but his true power comes in is ability to captivate an audience with his spoken words. If you are looking for an easy way to get started, I would recommend listening to one of his audio tapes, either Get the Edge or the Personal Power II program. One quick way to actually see Tony is to watch his infomercial for Get the Edge, which is his newest program.